Another day and another quarry, but this time the BriticeChrono Terrestrial team Rich Chiverrell and Matt Burke met up with some friends, with luminescence dating team Geoff Duller and Holly Wynne from Aberystwyth and stratigraphic geru Geoff Thomas to tackle the delights of rural Cheshire, Transect 3. Breaking all the rules for BriticeChrono quarry investigations the sun was out and not a snowflake in sight or site for that matter. Cherry Orchard Farm is one of a series of sand and gravel quarries to the east of the mid-Cheshire Sandstone Ridge, recently sampled for cosmogenic nuclide (CN) dating. The site (location 17 on the map) makes an intriging pair with cosmogenic nuclide location ‘Urchin’s Kitchen’ (location 16), a deeply incised bedrock channel eroded subglacially. We hope to compare the performance of luminescence and CN dating techniques with pairings like this. The setting contains numerous the active and former sand and gravel extraction sites around Delamere Forest, and is located on an extensive (8x5km) gently undulating triangular terrace or bench raised >10m above the floodplains of the Weaver Basin. 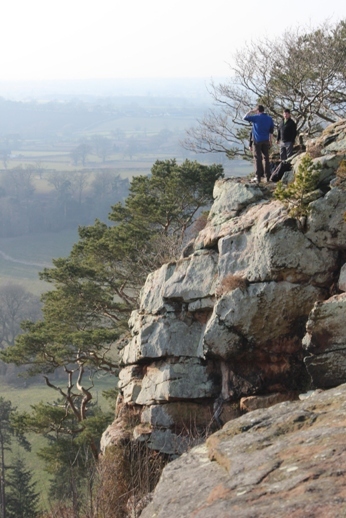 The terrace is fed by channels flowing from the Sandstone Ridge and presumably a former ice margin on the southern edge of zone 5 (see the map). Quarry operator (Richard Wilding) was fanastically co-operative and allowed us full access to the sections which reveal shallow water sandur and fine-grained glaciolacustrine sands. The sands were a dream to sample, well sorted, stratified, the right grain size for luminescence dating and with excellent exposure throughout the section. Four samples were taken arrayed vertically through the sequence, though probably almost identical in age given the depositional environment, we sampled different lithofacies or depositional environments. The lengthly process was completed in 5 hours, it takes 60 minutes to record the gamma dosimetry (with a field gamma spectrometer) for each sample, which gave plenty of time for discussion, strategy and logging. Then for some differing journeys home, it can’t take that long to drive to Aberystwyth can it?! Can’t wait for the dates and the next phase of sampling on transect 3….. This entry was posted in Geochronology specific issues, Terrestrial geology specific issues and tagged briticechrono, Cheshire, dating, fieldwork, glaciation, glacier, ice retreat, Irish Sea, lacustrine, luminescence, OSL, sand and gravel, sandur, sedimentology, transect 3 on March 21, 2013 by briticechrono. Peter Glasgow just spent a few hours at my home talking about erratics. He came across one in Ireland and has been inspired to do a piece for an exhibition in London this June. He needs to work out its source and then get artful. I gave him some clues to help. Here at BRITICE-CHRONO we will provide supporting information for him, and hey it might be of interest for us to visit and date. I am hoping it has a Scottish lithology. He might post a picture for us when he next visits. This entry was posted in Uncategorized on March 21, 2013 by chrisclarkofbc. Taking advantage of the improving weather and as the snows subside Rich Chiverrell and Matt Burke were joined by Derek Fabel and David Small (University of Glasgow) in getting the terrestrial sampling programme underway for BRITICE-CHRONO. The project a NERC-funded consortium that aims to constrain the rate of collapse of the last British-Irish Ice Sheet. The project will employ a number of dating techniques – Optically Stimulated Luminescence (OSL), Radiocarbon (14C), and Terrestrial Cosmogenic Nuclide (TCN) dating – in order to document the retreat of all major ice streams that drained the largely marine-based ice sheet. Terrestrial sampling along the Irish Sea East transect is now well underway after three days of intensive rock removal along the Mid-Cheshire Ridge for TCN dating. Although renowned for its flatness, the rolling farmland of Cheshire/Shropshire is broken by the enormous Mid-Cheshire ridge that reaches a whopping 227 m asl and is, conveniently, aligned roughly perpendicular to the retreating ice margin. As the ridge has been eroded by overriding ice and is cut by deeply incised meltwater channels it presents a great opportunity for us glacial geologists to do our thing: clamber around, stare at, chisel away at, and rest upon various rocks! Whilst Rich was enthusing year 2 undergraduates about the joys of glacial geomorphology, Matt, David and Derek began the day by braving the wilds of the Wirral with a stroll around Thurstaston Common in order to take a look at the ‘controversial’ Thor’s rock: a site of much debate as to the origin of the numerous erosion marks that cover its surfaces. Some believe the marks record scalloping by glacial meltwater, a plausible argument given the rock sits within a meltwater channel, yet the obvious steps and chutes down its flanks are probably testament to the alternate hypothesis that these marks simply record 100+ years of children climbing over and sliding down the rock! Meltwater or scallies: which was the greater erosive agent at Thor’s Rock? 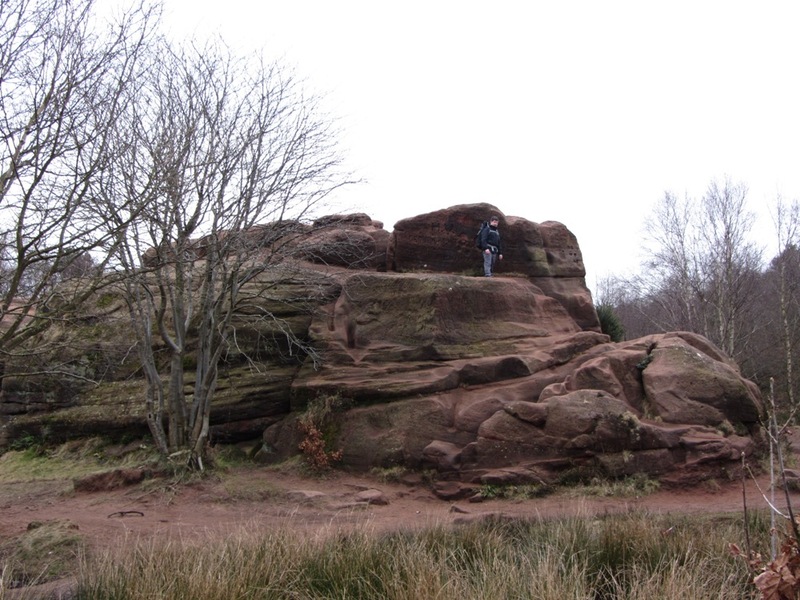 After careful consideration we decided to sit on the fence, concluding that many of the marks were originally scoured by meltwater, but have now been enhanced by the locals (us included) and so we decided to sample at a less controversial site: Thurstaston Hill. From here the team drove a couple of miles to Barnston Dale where we were joined by Rich, resisted the temptation of a 10 am pick-me-up at the Fox and Hounds, and hacked a piece of rock from the Barnston meltwater channel.Next stop Urchin’s Kitchen at Primrose Hill Wood. Following what seems to be a tradition for this transect, Rich and David did an excellent job of navigation (Rich: “we don’t need a map to navigate…”). Although we did eventually arrive at the site, we seemed to take the scenic route as we zigzagged our way across the countryside, which was all part of the plan, of course. On site we met up with Saskia Pagella and Vince Jones from C3W who filmed the sampling procedure and interviewed Rich and Derek with the eerie backdrop of the Urchin’s Kitchen. Unfortunately, although Derek gave us a great recital of a poem commemorating the discoverer of cosmic rays, it was not captured on film and it was a one-off performance. 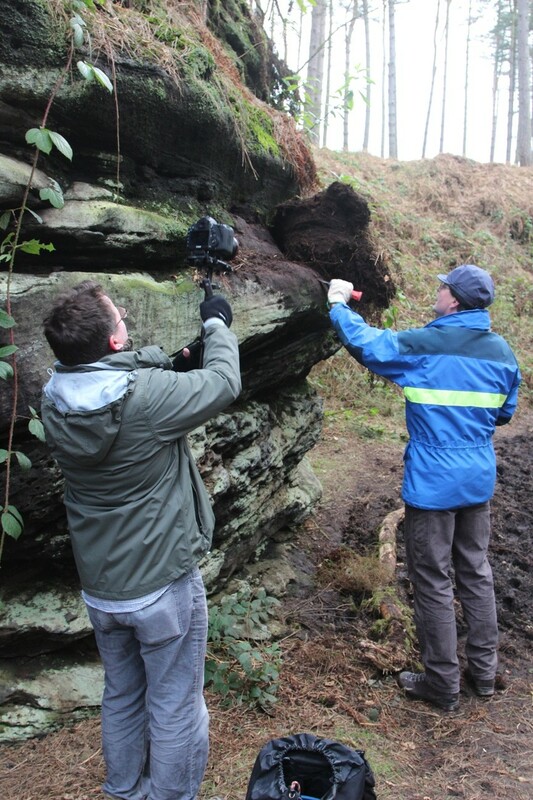 Lesson learned; always have a video camera at the ready in case of any future Britice-Chrono poetry recitals….. After a rather late lunch at Delamere Forest, the team finished off northern sector sampling by bagging (literally) rock at Manley Knoll and Helsby Channel. All in all, a very successful day of sampling, but could we cope without Derek on day 2? Afraid to look down: David measures the shielding at Raw Head. As Derek whizzed off to Sheffield to give a talk, Rich, David and Matt were left to pick up the pieces and continue with another round of TCN sampling. This time the central part of the ridge was the target, where surprisingly little bedrock was exposed. 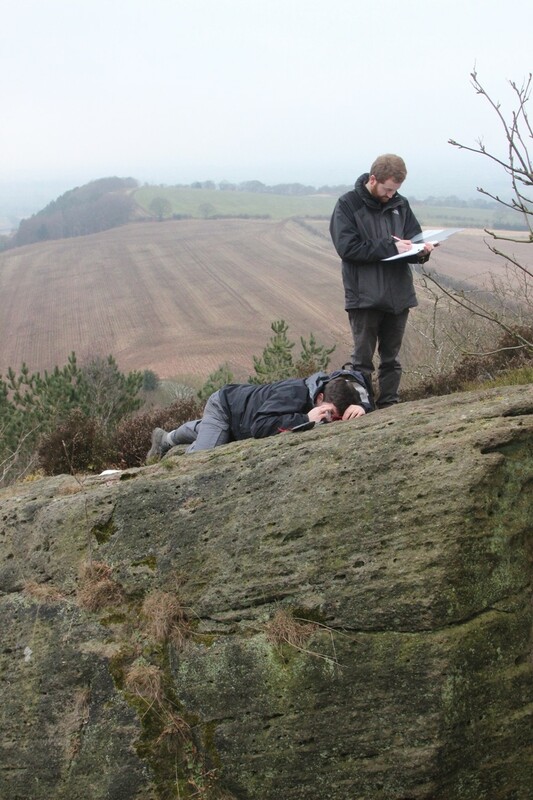 However, after several hours of rock hunting, David stepped into Derek’s shoes admirably and showed his skills at Raw Head and Bickerton Hill. Raw Head proved particularly challenging (not including having to avoid the local fox hunt on route) given David and Matt had to clamber atop a block that had slumped from the main outcrop and was hanging precariously above the valley below. 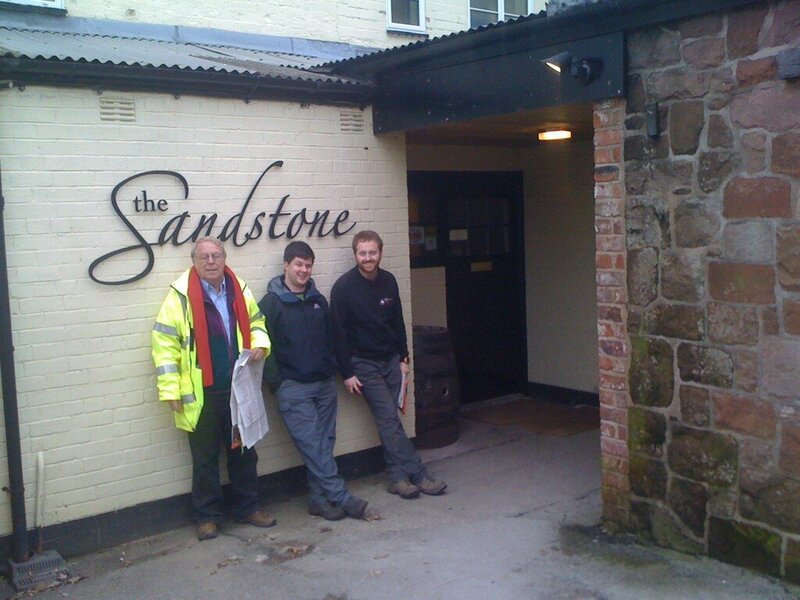 After a long and cold morning of walking the ridge, we were met for lunch by Geoff Thomas at the aptly-named pub “The Sandstone”. Along with a rather large lunch, Rich crumbled under the slightest of peer-pressure to enjoy a pint of “Scrum Down” (BRITICE-CHRONO approved beer 1) with the rest of us.Luckily, after lunch the fully-awake and motivated team were able to expend their excess energy with a couple of steep hikes. The first proved fruitless as we discovered on arrival at the outcrop that it had been heavily quarried. Thankfully, the second hike to the head of the very deeply incised meltwater channel that is Peckforton Gap produced something we could sample. After another successful day, Matt was finally able to break the habit and navigate us home without any major detours. Deeply incised meltwater channel at Hawkstone Park. Cautious bedrock sampling at Hawkstone Park. 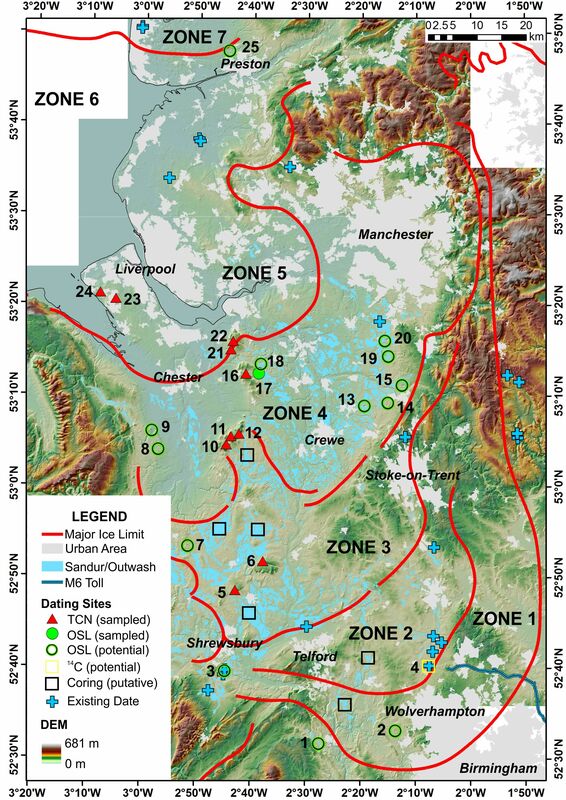 This entry was posted in Discussions of science, Geochronology specific issues, Terrestrial geology specific issues and tagged Cheshire, CN dating, fieldwork, sampling, Shropshire, T3 on March 8, 2013 by briticechrono.